This week we're interviewing a guy who helped pinball fight back against the popularity of video games in the 1980s. Ladies and gentlemen, The Pinball Blog proudly presents. The Pinball Blog: So you're Barry Oursler. Over 20 years working on pinball machines with the same company is impressive. Machines you've been involved with have sold over 100,000 units! Do you have a particular 'defining moment' you're most proud of? Barry Oursler: I think that seeing my first game roll off of the assembly line would have to be one of the highlights of my career. Who knew that I would be there for 26 years. TPB: Were you always aware that Gorgar would be the first talking pinball machine or was it a case of when technology was ready for that step it was the machine that was in production. Also were there any prototype 'talking' machines that we never saw? BO: The truth is that I was not totally aware when I started designing Gorgar that it would be the first talking machine. As the development progressed, our programmers had finished developing a speech program. The chip that we used had very little memory, so we could only use 10 or 12 words total. We had to come up with different phrases using combinations of those words. Everything had to be monotone so it would sound right. There were no other talking machines before that. TPB: PIN-BOT was hugely popular and also spawned a couple of sequel games. Did you think when designing the machine it would be such a success and what made it so? BO: I had a feeling that it would do very well for a several reasons. The game had a new feature, the visor and target bank. I teamed up with Python and Pfutz again. From my perspective, it was one of the first games ever designed after the artwork was done. Python had come up with this "crazy" drawing depicting a giant robot in space with flipper fingers. I studied his playfield artwork and designed a game around it. He had a "visor" on his drawing. I created a moving visor and used two eject holes for his eyes. I also created the target bank, which became his teeth. I had a lot of help with the mechanical devices, the visor, target bank & the spiral "skill shot", from Joe Joos. 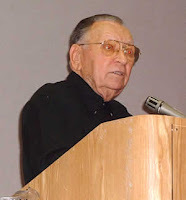 He was the best mechanical engineer I ever worked with. 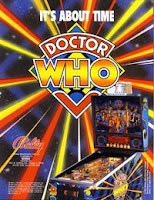 TPB: Following on from PIN-BOT, there are some similarities with the Doctor Who playfield. Obviously for us UK guys it was surprising to see a 'home-grown' theme being made by a company largely building for an American market. 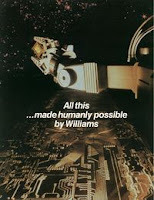 I understand that Bill Pfutzenreuter was a big Dr Who fan but did the license come up against much resistance from the powers that be at Williams? BO: Bill and I were both Dr Who fans, that's why we teamed up on it. Bill tried to design the playfield himself, but just couldn't get it to play the way he wanted it to. I agreed to take his concept and design a totally new playfield. The PIN-BOT bank was a huge success, so we decided to take it a step further. We mad it a 3-level moving playfield. It took a while to get it to work right, but with the help of Zofia Bil, our mechanical engineer, we had it working perfectly. I just sold my Dr Who last year. It still worked flawlessly after 15 years. I don't recall too much resistance from management over the theme. If you can show them that you truly believed in a project, they would usually give it a chance. 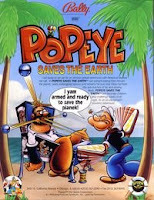 TPB: Popeye doesn't get much credit from the pinball collectors. I guess back then you were building for the coin-op market rather than thinking we'd be collecting them in our homes all these years later. Were you happy with the machine at the time? BO: Not really. Management wanted me to do another game with Python to try and capture the "magic" we had with previous collaborations. I wasn't too happy with the theme or the drawings that he had created. It was another scenario where the artwork was done first. I reluctantly agreed, due to pressure from "above". I think it was one of my two least favorite games that I designed, the other being BAD CATS. 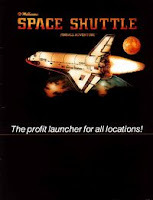 TPB: Space Shuttle is often credited with the revival of pinball against the popularity of video games. Did you think 'this is the one' or was the time right for pinball to fight back? BO: I believe that it really did spark the fire that revived pinball. We had a do-or-die situation. We were told that the next game had better be a "hit" or else that would be the end of pinball. Management & sales went over each project in development at that time. They decided to go with SPACE SHUTTLE. Luckily, it worked out. It's possible someone else could have had their game do the same thing, but we'll never know. TPB: Your brother Sheridan I believe worked at Stern for a while. Who's the better pinball player and was there much rivalry between you? BO: There has never been a rivalry between us, unlike the Ritchie brothers. 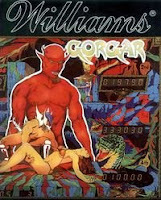 My brother was mainly working on video games for Midway, while I was at Williams. He never played much pinball. He is still working at Stern in the engineering department. TPB: Many of our Pinball Heroes say Steve Kordek was the most influential to their careers and I understand you had a close relationship with the great man. It must be time someone dished some dirt on Mr Kordek, maybe you can? BO: No matter how had I try, I don't think I can come up with anything "bad" to say about Steve. I don't believe you can find anyone who doesn't love and respect that man. If he does have any secrets, he's not telling! TPB: What does Barry Oursler do in the 21st century to pay the bills? BO: From 1998 to 2006, I worked for Betson Imperial Parts & Service as a purchasing manager. They are the largest distributor of games and parts in the USA. Sadly, I was laid-off a couple of years ago. For the last two years, I have been working for EcoSure, a division of Ecolab, a worldwide company. They are mainly involved in food safety, sort of like a health dept. Big restaurant corporations hire us to come in and evaluate their restaurants, hotels, etc for cleanliness, proper food handling, etc. I do mostly administrative work. TPB: Finally, I always ask our Pinball Heroes to sum up their involvement in pinball in one word or sentence. BO: It was a great ride while it lasted! I truly miss it! Many thanks to Barry Oursler for taking the time to answer my questions and becoming another of our Pinball Heroes. I'm constantly amazed at how much time these guys give to our hobby, maybe even years since their paths led in a different direction. More Pinball Heroes coming soon. Always loved the "heartbeat" sound effect in "Gorgar", and both "Pinbot" and "Dr Who" are truly classics. IMHO Barry is one of the most under-rated of all designers. Barracora and Cosmic Gunfight are classics. I'm not sure if you are aware that the original title for "cosmic Gunfight" was "Dragonfly". We had all of the artwork completed when someone from management decided that we should use a different theme. In addition to our 'in-house" art department, we were still using an outside company called "Advertising Posters". Their are department submitted the "Cosmic Gunfight" artwork. I had to make a few revisions to tie in the theme with the playfield. In the end, it worked out pretty well. I guess that we were the first "Cowboys & Aliens". Iagree. Mr. O is one of the best. I have a cosmic in the basement and i think ill keep it forever. Have a cosmic. Restoring now. Thanks Mr. O One of the legends. Now for a black knight.